Join me, Italian Chef and lifestyle expert Deborah Dal Fovo, as I partner with Chianti Classico winemaker and cyclist Francesco Mazzei to offer this unique Italian insider’s enogastronomic cycling experience in Tuscany. 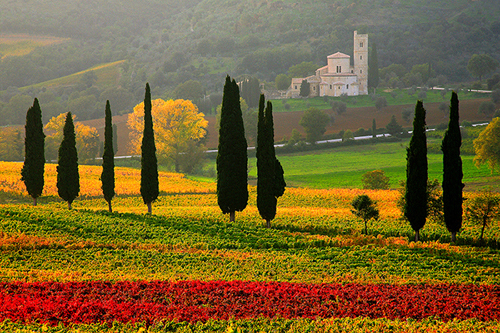 The Tuscany Wine Trail Cycling Tour is a challenging 4-stage journey through the 4 most prestigious wine producing areas of Tuscany, Chianti, Montalcino, Scansano, and Bolgheri, with breathtaking panoramas at every turn of the route. 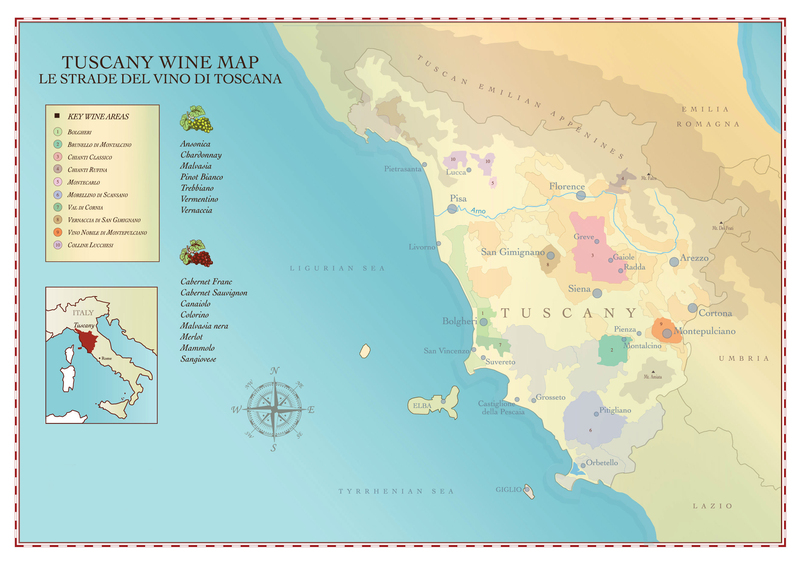 Held during the exciting grape harvest “vendemmia” period in Tuscany, it is a full immersion into the world-renowned Tuscan wine world. With a total of 450 km/280 miles and 7,000m/23,000 feet of climbing, this tour is recommended for cyclists who are well prepared and have an adventurous spirit. Along the route, we discover Tuscany’s iconic food, wine, history and culture that will give participants a well-deserved reward for their hard work. 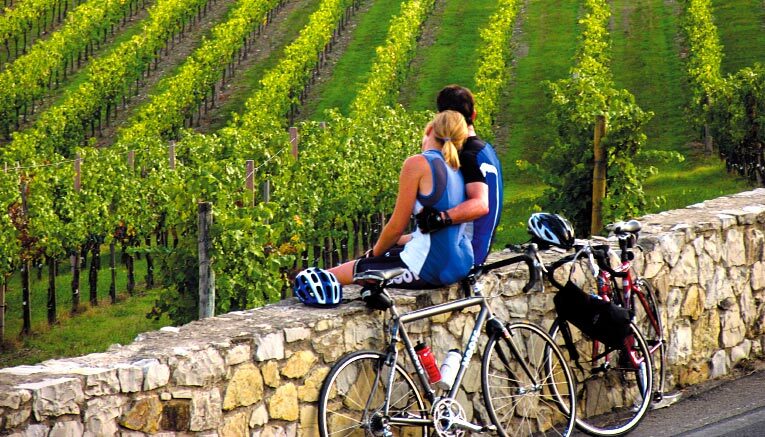 Non-cyclists partners are welcome on the tour and a rich, tandem itinerary of activities is planned along the cycling route with meet-ups at our destinations for wine tastings, sumptuous dinners and lodging making this the perfect getaway for couples. Overview: This increasingly challenging first cycling stage along the “Chiantigiana” road surrounded by the magnificent Chianti Classico vineyards will take us into the heart of Siena, famous worldwide for its immense beauty. We will then continue in the direction of Asciano with a challenging ride up and down through the spectacular Crete Senesi, where the succession of gullies forms a picturesque landscape with lunar features. We will then get to Pienza, a tiny, pretty town and Unesco world heritage site, then to S. Quirico d’Orcia, another important medieval town. After a few kilometers downhill, we tackle the last climb along a stunning landscape to reach beautiful Montalcino, the home of Brunello di Montalcino, one of the world’s most notable wines. Accommodation in hotel in Montalcino. 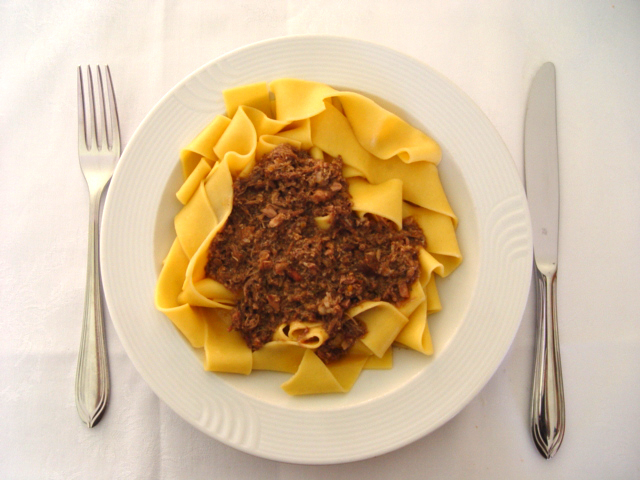 • 7:00/8:00 – dinner at a local restaurant with Morellino DOCG and Maremma DOC wine. Overview: A demanding stage that goes across the southern Brunello area and its manicured vineyards to get to Castelnuovo dell’Abate and the magnificent abbey of Sant’Antimo, one of the finest examples of Romanesque architecture in Tuscany. We continue descending to the Orcia River to face a long and challenging climb on the slopes of Mount Amiata passing through the towns of Seggiano and Arcidosso, with its lordly medieval fortress “Aldobrandesca”. Another steep uphill stretch to reach Santa Fiora, where the headwaters of the Fiora River give life to a spectacular 16th century fishpond. We then climb for about 4 km with steep sections and short stretches of gravel on a beautiful mountain road. Once on the ridge, we pass by the castle of Triana and the town of Roccalbegna. From there we prepare to tackle the last kilometers to reach the proximity of the town of Scansano, turned in the ‘700s to deputy provincial capital for “estatatura” (the transfer in the summer of the municipal offices from Grosseto due to the risk of malaria), today made famous by its Morellino di Scansano wine. Accommodation at the Antico Casale di Scansano hotel. • Various rest stops along the route with site seeing, picnic lunch etc. Overview: Long but soft stage with the first kilometers slightly uphill but followed by an enjoyable descent of around 15 km with spectacular views over vineyards and the Tyrrhenian Coast. After a long flat stretch we climb to the ancient town of Massa Marittima, one of the jewels of Maremma. We continue towards the Val di Cornia through surrounding nature reserves to Suvereto, a town that is part of “The Most Beautiful Villages of Italy Club” and famous for its wines. We then face an easy long climb that will lead us to Sassetta from where we will start the descent towards Castagneto Carducci, home of the famed poet Giosuè Carducci. The last few kilometers downhill will bring us to the “Costa degli Etruschi” with overnight stay at hotel Il Bambolo. • 9:00 – depart Bolgheri for Chianti Classico (118km/73miles; 2145m/7037 ft) with rest stops along route for site seeing, picnic lunch etc. 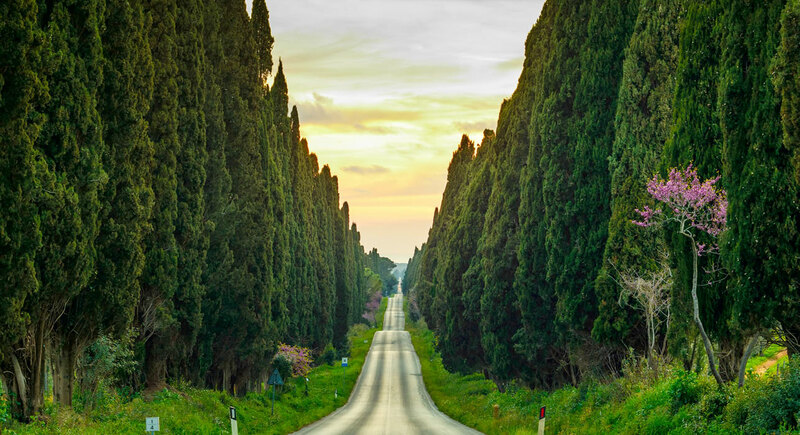 Overview: This last and challenging stage will start in the fascinating vineyards of the Via Bolgherese, home to world famous Super Tuscan wines, taking us to the village of Bolgheri riding along the magnificent cypress-lined road celebrated by Italian poet Carducci. We continue towards Bibbona and Saline di Volterra along an amazing landscape before making the tough climb up to Volterra, a major Etruscan settlement famous for its alabaster. Then in a continuous up and down ride we head to San Gimignano, the wonderful medieval town known around the world for its towers, from which we will reach the nearby Poggibonsi in the Val d’Elsa. The last long and soft climb will take us into the Chianti Classico region to Castellina in Chianti, then to the well-deserved finish back at Fonterutoli. 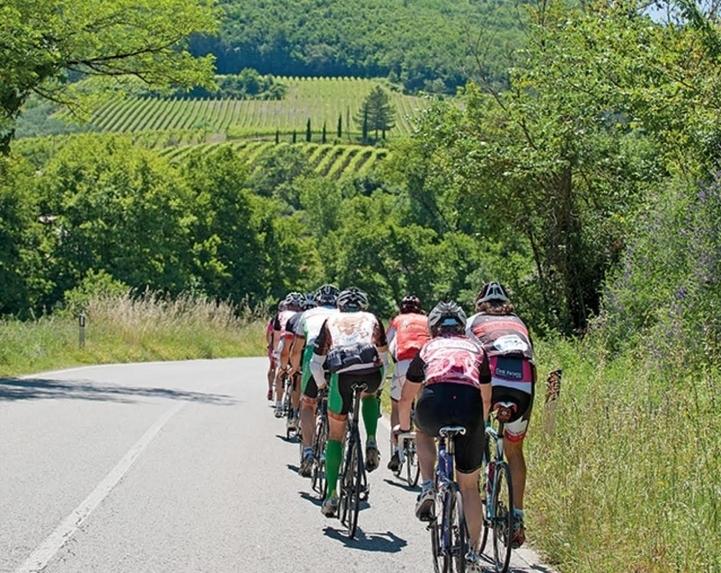 • E-bike tour for entire group through Chianti with winery visits and tastings. 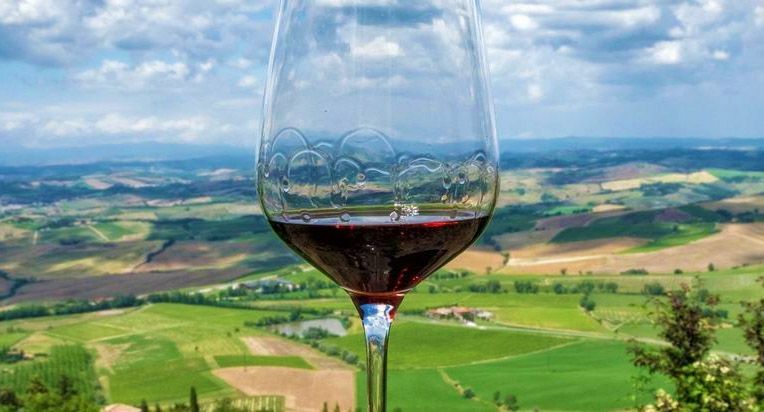 Overview: Following our intensive road trip, we will have a relaxing day of touring the Chianti wine appellation on e-bikes to get a taste of the Tuscan “bella vita” and enjoy local food, wine, and culture together. Note: *Timing, activities, and itinerary during tour may vary according to unforeseen circumstances, weather conditions, availability, performance, or to enhance the trip experience. Organizer reserves the right to substitute a service/good with one of equal or greater quality. We will be accompanied by expert guides, mechanics and masseurs, some of them with long experience in world championships Tour de France, Giro d’Italia and Vuelta whose assistance we can count on during the journey. We will have everything necessary for emergency repairs, but it is essential that the participants bring with them a kit for repairing any punctures (1 air chamber and 1 can of CO2 with dispenser). It is mandatory to have bicycle checked before departure to avoid wasting time on issues due to poor maintenance. • energy bars, gels, and mineral salts. Participating cyclists must cautiously respect Italian road rules and follow the guide’s instructions. Cyclists are required to provide a copy of a current medical certificate stating that they are fit for cycling and sport activity. They will be provided with an Italian Cycling Association membership that includes liability insurance toward third parties. In order to participate in the tour, cyclists will be asked to sign a release. 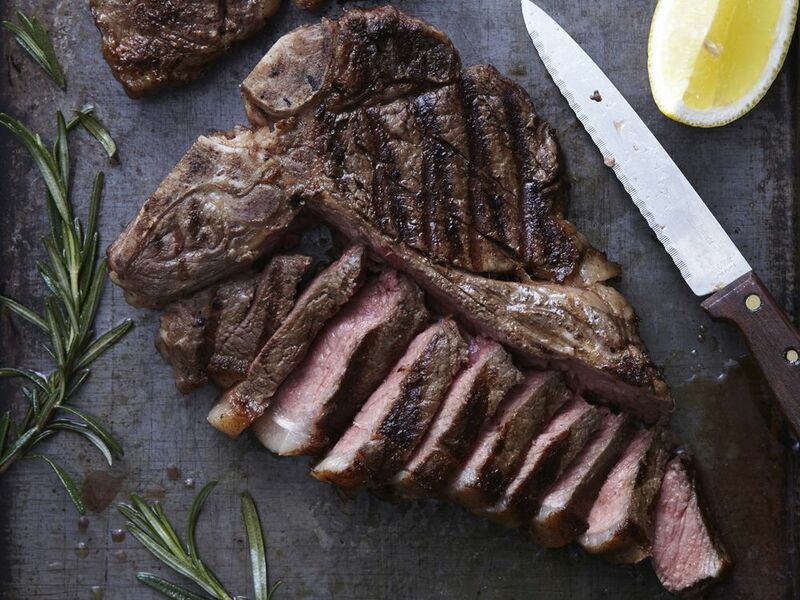 • Cyclists will be supplied with food, beverages and supplements during the whole ride. • $3995 per person based on double occupancy. • Single occupancy rooms available at a supplemental cost of $700. To reserve your spot: A deposit of $1,500 per person is required to secure your spot. Final payment of the remaining balance is due 90 days prior to the tour start date. Payments can be made using US domestic checks, wire transfers, or credit cards (please note that a 3.5% transaction fee for payments via credit card is applicable). If you have any questions or wish to reserve your spot for this tour, please use the contact form below. Upon receipt of your inquiry, I will send you the necessary booking instructions, payment schedule, and terms & conditions.